AquaCare is a leading teeth cleaning system that uses a mix of air, water and powder to gently wash away staining and to brighten teeth. 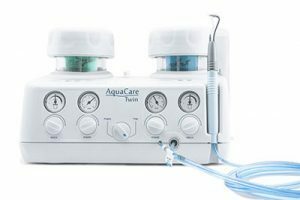 AquaCare uses breakthrough technology to deliver a comfortable, quick cleaning procedure by using a fine stream of fluid combined with a tiny volume of powder directed at the teeth to be treated. Decay is then comfortably removed with minimal sensation, leaving healthy tooth material undisturbed. This innovative non-invasive treatment, gently removes staining, is kind to the tooth surface, doesn’t damage the structure of your teeth and improves tooth brightness. Results are immediate. Talk to our friendly dental team on 0151 722 6500 to book yourself in with our hygienist – we would be delighted to help you.